Insurance group: 26 - 39 How much is it to insure? At first sight, the 2019 Range Rover Evoque looks reassuringly familiar. Don't worry – the old car's ageing kit has been replaced by cutting-edge tech, with an emphasis on driver aids and drivetrain efficiency. In its seven-year life, the previous Range Rover Evoque was a huge success for its maker, bringing its premium image to a new market sector. More than 750,000 have been sold worldwide and you can guarantee that each and every one of those sales has been highly profitable. . It's been a critical success, too, with 217 awards under its belt. That's more than any other British-built and designed car. Given that Land Rover's parent company Jaguar Land Rover is struggling financially, thanks to a very diesel-heavy range, and with the economic effects of Brexit, this car needs to do well. The cars that followed the Evoque, from the current Range Rover Sport to the Range Rover Velar, have all in one way or another, been influenced by the design and marketing of it. What's new about the 2019 Range Rover Evoque's styling? Quite a lot. First thing's first: despite looking very much like the outgoing model, this is a brand spanking new model. So has Land Rover made a mistake making its smallest Range Rover look barely any different from before? Land Rover clearly knows what it’s doing. That it’s a careful, measured evolution of the old Range Rover Evoque is a very deliberate strategy: it will continue to attract new buyers who were wowed by the desirabilty of the original, without making existing customers feel outdated with an SUV packing a design stuck in the early 2010s. The family look begins with the Range Rover Velar-aping matrix LED headlamps and elongated tail lights, which are bisected by the tailgate. There’s also a dash of street theatre courtesy of the pop-out door handles, which debuted on the Velar. It looks similar – so where is the progress? Although the new Range Rover Evoque takes up almost the same amount of space on the road as the old model, its underpinnings are all-new and more space-efficient, able to accept electrification of the engine options. Under the bonnet, there have been changes, although all are still powered – for now – by Jaguar Land Rover's Ingenium range of petrol and diesel engines. At launch 2.0-litre engines of both varieties are available, all with automatic transmissions, barring the entry-level front-wheel drive 150hp diesel which has a manual gearbox. The most interesting development is the use of a new 48-volt mild hybrid (MHEV) system, which is fitted to all of the automatic models. This is used to recover braking energy, which is stored in a battery to use for low-speed driving and to boost performance when accelerating. Late in 2019 a plug-in hybrid with a three-cylinder petrol engine and a larger capacity battery will also be available. There’s a significant uplift in the cabin’s quality and glamour with yet more Velar-inspired touches, such as the pair of 10-inch touchscreens. It’s clean and uncluttered, but with so few knobs and buttons, prodding different parts of the screen to control things will take some getting used to when driving. It feels sumptuous inside the Evoque with a choice of leather trim, faux suede, a woollen option and a new eucalyptus-derived textile. For such a high-tech cabin, Land Rover’s chosen to debut a couple of new showcase features in the new Range Rover Evoque. Called ClearSight, at the touch of a button the rear-view mirror converts into a display screen for a camera mounted at the rear – perfect if your rear seat passengers or stuff in the boot is cluttering up your view. The other is grandly titled Ground View Technology, which projects a 180-degree under-vehicle view from the front of the Evoque, making it easier to avoid kerbing wheels in tight city car parks or boulders when off-roading. What is the 2019 Range Rover Evoque like to drive? Very good. The main areas of improvement over the old Evoque are engine insulation and ride comfort. So, when you fire up the diesel-powered model, it's hushed at idle, and pulls away without fuss. It's smooth and refined – which shows that Land Rover has made giant steps in making its Ingenium engine as quiet as the best opposition. Performance is excellent in the two models we tried. The D240 shares its engine with the Jaguar E-Pace and Land Rover Discovery Sport among others, and feels fairly similar to those cars, with a 0-60mph time quoted by land Rover of 7.0 seconds. It doesn't feel that quick thanks to an accelerator that lacks responsiveness, and a smooth and unflustered nature. The P250 is also much more refined than before in the engine department, too. It's hushed all the way up to motorway speeds, and even if you're accelerating hard, it rarely gets noisy or intrusive. It handles neatly in bends, and rides smoothly over badly-maintained roads – and nearly always leaves the driver feeling both special and relaxed. In a nutshell, it's a refined, grown-up SUV that would take to a life on the road without any problems at all. What's the Evoque like off road? Land Rover says that the Range Rover Evoque retains the excellent off-road prowess of its predecessor. On the strength of our drives, we have to agree. Thanks to the excellent Terrain Response 2 system, which automatically adjusts how the car behaves based upon what surfaces it detects it's being driven on, it's a piece of cake to keep in motion in the worst conditions. If you really want to, you can drive through water up to 600mm deep – that’s a 100mm increase over the old Evoque. The driving position is spot on, and the controls are familiar for anyone who's come out of an old Evoque, or who has any experience of the Velar. The low-speed throttle response is excellent, exactly what's needed for trickling around at low speed. Both the MHEV petrol and diesel mild-hybrids work well – the electrical boost kicks in at low speeds, rendering the car effectively silent in heavy traffic, and benefiting getaways from standing starts by helping to bolster low-speed responsiveness. Overall, it's excellent to drive off-road – both through excellent in-built abilty and the use of clever systems such as Ground View Technology. It's tough, comfortable and easy to drive. 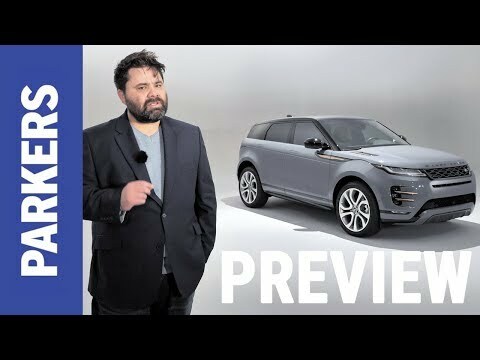 Is the 2019 Range Rover Evoque family friendly? It's better than it was before, with improved rear room, especially. The new car's wheelbase has been increased by 20mm with more rear legroom, while the front seats are positioned differently so that your feet have somewhere to stretch out underneath. Note that it’s a five-door only this time around – sales of the slinkier three-door Coupe were too low to justify a replacement – as for a new Convertible, there’s no word one way or the other. There’s also more space in the cabin to hide all sorts of detritus, while the boot’s also around 10% larger. With all five seats in place there’s 591 litres of boot space, extending to 1,383 litres when the rear bench is folded – that’s larger than an Audi Q5 with the seats up, but smaller with them folded. How much does the 2019 Evoque cost to buy or lease? Trim levels are Land Rover’s familiar S, SE and HSE arrangement with sportier R-Dynamic versions of each, plus a special First Edition to celebrate the launch. Prices start at £31,600 for a manual D150 S version. Orders can be placed now, and cars are now appearing on the roads now. Despite having just hit the market, the Range Rover Evoque is already looking like cracking value on personal leasing deals – a fact you can put down to high predicted resale values. If you make an initial payment of £4,000 (plus processing fee of £199), you'll pay £230 per month* over the next 23 months for a D150 R-Dynamic version. This is on an 8,000-mile contract, and if you go over this mileage, you'll be charged £112.60 per 1,000 miles in excess fees. Should you buy a Range Rover Evoque? We say yes, although it comes at a premium for cash buyers. The 2019 Evoque replaces a car that's sold in bucketloads, and which – seven years on from its launch – still looks fresh and oozes desirability. So, the good news for Evoque fans is that the 2019 car looks and feels so familiar. The arrival of the 48-volt mild-hybrid version puts it bang on the pace with its opposition, while 2020's PHEV will add further appeal for those moving away from diesel. For those who aren't, the retention of a 150hp entry-level model means that those who favour cars fuelled from the black pump aren't denied a decent option, too. Given the excellence of the Evoque's handling and ride quality, its step change in terms of interior quallity, its increased practicality and uprated tech, as well as the importance of this car to Land Rover, be in no doubt that they will have thrown the kitchen sink at it in order to continue its undoubted success story. Right now, we'd recommend it over the opposition, but make sure you don't go mad on the options in order to keep the monthly cost down.